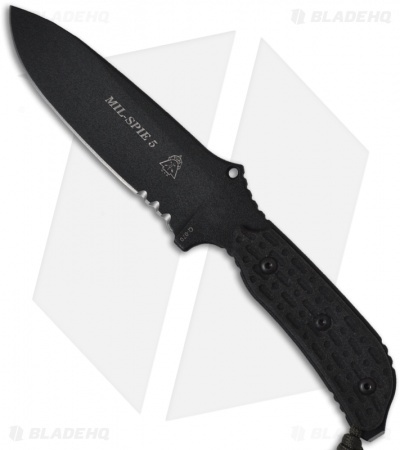 This is the TOPS Knives MIL SPIE 5, it is the larger of the TOPS Knives MIL SPIE line (Military-Special Projects Individual Equipment). Designed for Combat. Proven in Battle. Built for Special Operation Forces. The MIL-SPIE 5 is more adept at belt or vest carry, while still maintaining a low profile. The scales are black linen micarta with our dot dash dot pattern imbedded in the handle. The handle scales are removable and the skeletonized knife seems to be as popular as the one with handles. The blade has a black traction coating. 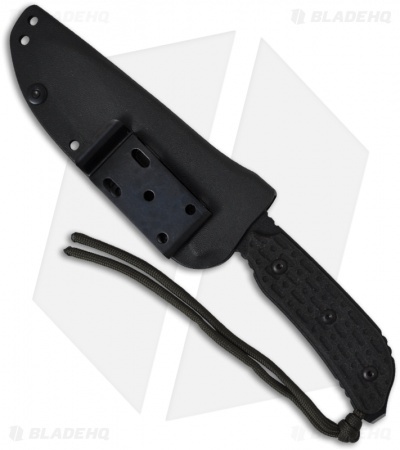 The sheath system is heavy duty Kydex, which locks the knife in place in the closed position and has a steel spring clip for attachment in a variety of positions.